1. Sunday Riley Ceramic Slip Cleanser - Sooo many mixed reviews on this product, and after using it I can understand why. The first time I applied it, I used 3-4 pumps and was left with the driest most uncomfortable skin imaginable. After reading some tips online, I amended my application to only one pump as recommended and it performed much better. Yup, "they" were right. The cleanser helps to make my skin feel fresh, clean and balanced each morning which is just what I need to wake me up. This is one of those times when I am glad I listened to the Internet. 2. 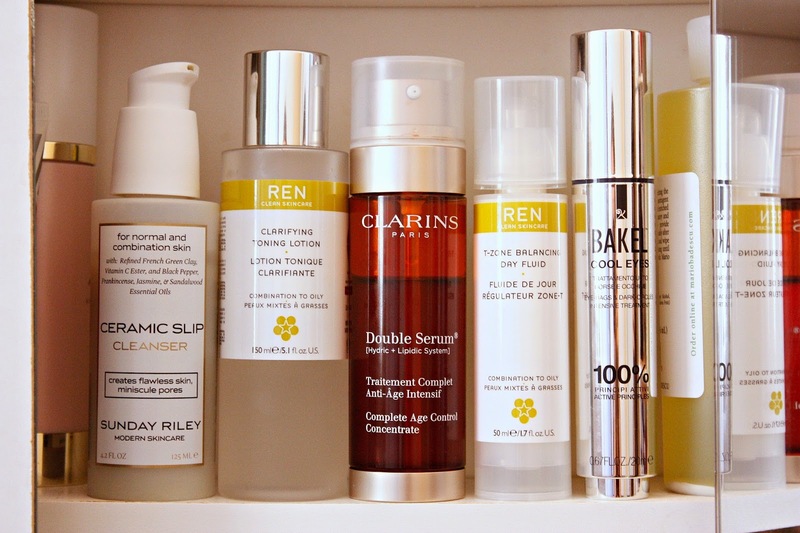 REN Clarifying Toning Lotion - If I am not using my First Aid Beauty Blemish Patrol Pads during a breakout, I use this REN clarifying toning lotion after cleansing. I prefer to use an exfoliating toner for both my morning and evening routine and then follow it up with a hydrating mist (this one is a favorite) or balancing lotion/essence (alternating between this one and this one right now). The glycolic acid and salicilin in this toning lotion helps to remove any dead skin cells and purify congested skin, preparing my skin for the rest of the treatments. 3. Clarins Double Serum - I feel that you truly can't call yourself a skincare lover until you have added this cult classic to your routine. Every time I have posted it on Instagram, the first thing everyone says is how much they love this serum. The bottle houses two different formulas that dispense simultaneously when you press the pump which is one of the coolest features of this serum. The fact that the ingredients are designed to help reactivate skin's functions, reduce wrinkles, even skin tone and firm skin is just an added bonus. And for me this serum wears beautifully under makeup, and feels amazing on the skin. One pump is enough to cover my entire face and my skin immediately looks smoother. I feel this is the one serum that any age or skin type can use and should add to their routine. 5. Bakel Cool Eyes - I have a lot of trouble sleeping as well as the issue of waking up with intensely dry eyes so I need an eye cream that immediately helps soothe and hydrate. This has been my go-to eye cream for the past few months and I am loving it. For more details, check out the full review I did on this eye cream a few weeks ago. What is your current skincare routine? Tell me in the comments below! Love your skincare posts Maree!